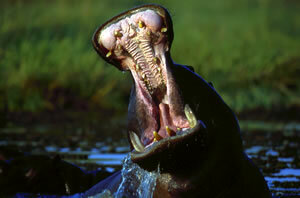 The Hippo Route is one of Travel Adventure Botswana’s pre-costed Botswana self drive safaris. Arranged by the experienced guides at Travel Adventure Botswana, the Hippo Route allows self drive safari guests to enjoy their tour of Botswana with out having to concern themselves with plotting routes of getting lost. The Hippo Route offers you a 10 day journey through Botswana. Starting in Maun, the Hippo Rout self drive safari will carry you through the beautiful Khwai and Savuti areas of Moremi Game Reserve and into Chobe National Park. You will experience the wilds, and fantastic game viewing that Botswana’s major Game parks have to offer before arriving in Kasane for your passage home. If however, 10 days was not sufficient time for you to take in all the wonders that Botswana has to Offer, Travel Adventures Botswana offers to extensions to the Hippo Route for you to choose from. The first extension takes your Botswana self drive safari for another 5 days into the heart of the Mkgadikgadi Pans. Visit the austere Kubu Islands, witness the majesty of the ancient baobabs and the silent beauty of the Njuca Hills before travelling to Khumaga and then completeing your round trip back in Maun for your flight home. Extension 2 takes you on a sojourn into Namibia and the Kwando River in Caprivi where you will spend your time camping alongside the river before moving on to Ngepi Camp. From here you will travel back into Botswana and the Tsodilo Hills before returning to Maun and then home. 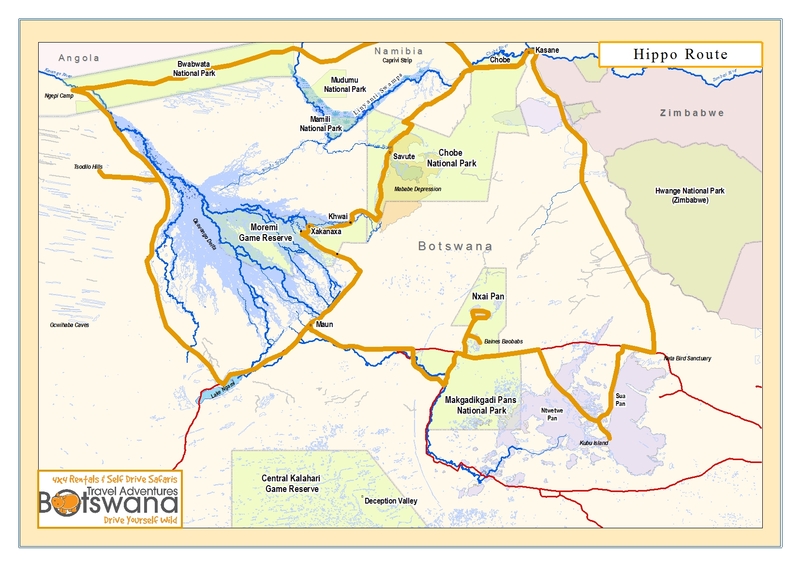 If you would like to view the full itinerary and rates you can download the Hippo Route pdf here. Or you can contact Travel Adventures Botswana directly by clicking here.